Check here for scans of EVERYTHING!! CHECK THE "UPDATES" ON THE LEFT FOR ALL MY UPDATES AND SUCCESSES. My favorite thing to collect is Home Run balls. Check out the ones I've caught here. This site will be about my through the mail and in person autograph collection. I used to run a site similar a few years ago that was somewhat popular, but I was forced to shut it down at its peak. This will be just about my current TTM successes, and autographs I obtain in person from this point on. I have too many in my collection to put up on here, so if you stay with this site, it will be like watching a new collection start out. I live in San Antonio, Tx. Home of the San Diego Padres AA farmclub, the Missions. I go to every game I possibly can, which usually ends up being almost every home game. I started attending games in 2002, and then started getting the players autographs the next year. In 2004, I realized, "wait a minute, theres a visiting team too..." and my collection just took off. I DO NOT SELL autographs I received through the mail or in person. If the player took the time and was nice enough to oblige me with an autograph, I am not going to turn around and sell it for a profit. Now, I have sold a few autographs on ebay before, but they were all things that the player was PAID to sign (i.e. pack-pulled certs, or card show signings that cost money). If the player does not make a profit off of it, neither do I. Trading on the other hand, I will do. Because that how the hobby originated. "TRADING CARDS"... Yes, it makes sense now, doesn't it? 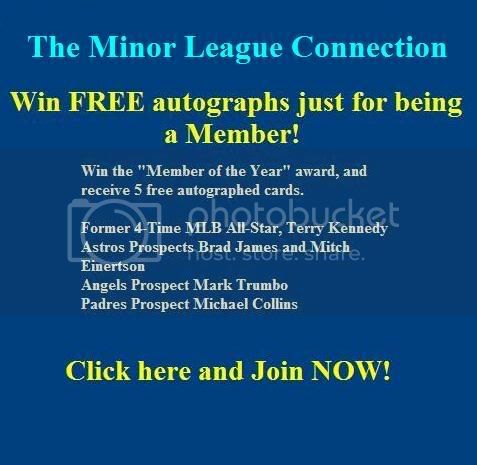 I will ONLY trade if I have more than one autograph of a player I'd be willing to part with, or if its a certified I don't want. This, is my prized possession. 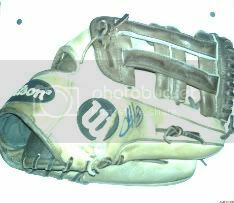 Chase Headley gave me his fielding glove at the end of the 2007 San Antonio Missions season. It was a trade he thought was fair since I gave him his FIRST Major League Rookie card, a 2007 eTopps card that came out in June 2007, when he got called up to replace an injured Kevin Kouzmanoff.